I hope you will still love me after this revelation. I hate snow. I hate winter. That’s right, HATE. But it doesn’t end there. I’ve only skied once in my lifetime, when I was eight, only to fly down the hill and run straight into the shed holding the man who operated the ski lift. To say I’m NOT a snow bunny is the most accurate statement to date, and quite obvious if you meet me in person. After living in Florida (as a kid and again in college), I am more of a palm tree-obsessing, sandy-beach-laying, sunshine-chasing kind of girl. So the snow currently falling is unnerving. I’m well aware that I live in a climate that snows and that it will only continue for the next few months, but I can’t help but imagine myself in the lushly green terrain, light blue waters, and warm breezes of paradise. I’m talking about a place where the cocktails flow like wine. Where bikini-clad women instinctively flock to the white sand beaches to soak up all the sun. That’s right, I’m talking about a little place called Hawaii. Oahu to be exact. My husband and I spent 10 glorious days on the beaches of Oahu for our honeymoon, and both fell in love with the relaxed culture, laid-back atmosphere and vibrant flavors of food. We indulged in countless cocktails, ate copious amounts of crab cakes and freshly caught poké and experienced the Hawaiian classics—like mac salad and Dole whip. After 10 full days though, I was ready to sleep in my own bed, see my family and cuddle with my kitties. I’ll admit I was a little bummed to return to our landlocked state…simply for the lack of poké. However, in the past two years, America’s poké obsession has become real. This raw, sushi-grade fish has made its way from the island of Hawaii to the mainland and stolen the hearts of many—myself included. 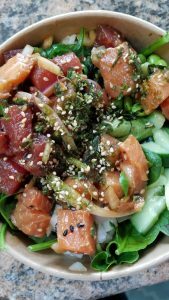 Although poké remains a traditional Hawaiian sensation, the trend is growing at a rapid pace. Las Vegas, Minneapolis, and our landlocked city of Denver are some of the only stateside cities where poké has become a popular staple in dining. Thankfully now, I can taste the unique and fresh flavors of Hawaii in my own backyard, and so can you! Here are six popular joints’ taking our poké cravings to the next level—without the seven-hour flight to Hawaii. Named by Buzzfeed as THE restaurant to try in Colorado, Turtle Boat brings the traditional elements but presents their own take on Colorado poké. This small yet popular place on South Broadway introduces a simple menu with unlimited toppings and sustainably-sourced seafood for a healthy and indulgent meal! With the opportunity to build your own bowl with over 14 different proteins (like trout, salmon, octopus, cuttlefish and Hawaiian Kanpachi) to choose from, staff recommends making a different choice than traditional Ahi Tuna. Their commitment to fresh and delicious eats is obviously a local’s favorite, and it’s easy to see why this place has become so popular! Poké Concept is the true definition of fast casual dining. With locations all across the metro, this unique spot on the poké map checks all the boxes. Online ordering, quick pick-up or delivery through GrubHub, and overflowing poké bowls are their specialty. While the menu is extensive, the pre-made signature bowls are available for those of us who have a hard time building our own bowl. Whether you fancy a classic taste (traditional poké and salmon) or prefer something more unique (spicy crab salad or Hawaiian spam), this place has got you covered, with a massive portion. Come hungry! On a mission to provide the best service and taste, Rocky Fin Poké Bar employs only the best staff to create the poké bowl of choice. By purposely not pre-marinating their Ahi Tuna, the poké masters create a fresh taste of the ocean with a modern and unique twist. The menu and process of indulging is simple—choose a base (usually rice or spring mix), choose a protein, choose your toppings, choose your sauces and choose any add-on. This new(ish) addition to Colfax creates all the buzz and has made a great addition to the poké craze in Denver. 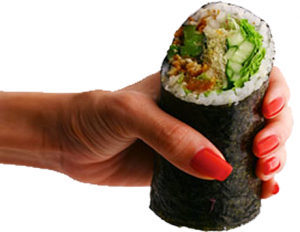 Featuring an Asian-inspired chef, Komotodo Sushi Burrito brings together the traditional sushi elements and modern poké flavors like you have never seen before. This fast-casual eatery prepares each order in the form of a burrito—much like a sushi hand roll—but bigger! While the menu is small, it features premade burritos sure to entice any palate! 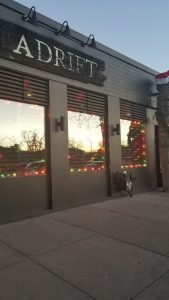 From fresh ahi, salmon and marinated steak (for those non-seafood lovers) to specials daily and a full bar, this place is unique to Denver, and a local’s favorite. For a more traditional Hawaiian experience, Adrift Tiki Bar salutes all diners by bringing delicious hand-crafted cocktails and island-inspired dishes in a traditional tiki setting. In addition to its vast island and poké menu, Adrift hosts an all-you-can-eat Luau dinner on the last Sunday of every month. My husband and I recently took part in this event with another couple, and we found ourselves right back in Hawaii. It features a buffet of sticky coconut rice, classic slaw and pickled cucumbers, cold mac salad and freshly baked Hawaiian rolls, served with spit-fired glazed pork, guava BBQ ribs and curry chicken! In addition to the Polynesian performing dancers, the space exudes island vibes, creating the most special atmosphere! In June 2016, Louie and Regan Colburn opened Ohana Island Kitchen–a tribute to Louie’s Japanese/Hawaiian upbringing. Ohana Island Kitchen, although small in size (a small walk-up in LoHi), is the embodiment of long-held Hawaiian beliefs, creating and serving food made with love and the treasured Aloha spirit. With a delicious menu centered on various styles of poké, this one-of-a-kind establishment also features classic Hawaiian staples like Spam musubi, guava cake and pork sliders with crunchy homemade slaw! The refreshing and vibrant flavors and colors provide the perfect Hawaiian backdrop. Be sure to wash the meal down with canned Hawaiian juice or a refreshing blended Kona Coffee! Forget the plane tickets and cramped seating, and treat yo’self to a taste of paradise! Now, is it lunch time yet?